← Do All Things With Love… Indeed. 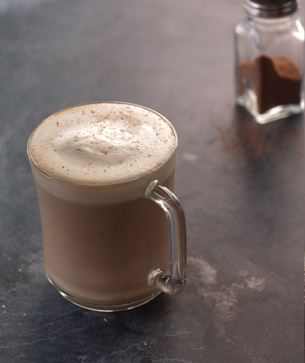 Since December has arrived, so have the decadent coffee drinks. You certainly can’t miss the signs and smells of the holidays if you go within walking distance of coffee shops in the Seacoast! Indulging every now and then may not have detrimental effects on your waistline, but imbibing regularly might. Since we got our amazing coffee maker–a Jura Impressa–I don’t grab coffee on the road much anymore unless I’m going with friends. I’ve been incredibly spoiled by this machine! However, I have occasionally been caught by the aroma of espresso wafting on the air while out and about. Especially now that the holiday lattes are on the menu. If you are like me, you probably want to enjoy the taste of these offerings with minimal guilt. So, you find ways to cut the calories or fat. But sometimes that means sacrificing taste. I know… I know… It’s the old adage of damned if you do, damned if you don’t, right?! Not anymore. I bought So Delicious Coconut Milk “Nog” today. After steaming it in preparation for a sort of Egg Nog Latte, I deemed this organic beverage tasty enough without the addition of espresso or coffee! With only 90 calories in half a cup, it’s a winner! Give it a try! This entry was posted in food, lifestyle, recipe. Bookmark the permalink.